Various measures of observer agreement have been proposed for 2x2 tables. We examine the behavior of alternative measures of observer agreement for 2x2 tables. The alternative measures of observer agreement and the corresponding agreement chart were calculated under various scenarios of marginal distributions (symmetrical or not, balanced or not) and of degree of diagonal agreement, and their behaviors are compared. Specifically, two specific paradoxes previously identified for kappa were examined: (1) low kappa values despite high observed agreement under highly symmetrically imbalanced marginals, and (2) higher kappa values for asymmetrical imbalanced marginal distributions. Kappa and alpha behave similarly and are affected by the marginal distributions more so than the B-statistic, AC1-index and delta measures. Delta and kappa provide values that are similar when the marginal totals are asymmetrically imbalanced or symmetrical but not excessively imbalanced. The AC1-index and B-statistics provide closer results when the marginal distributions are symmetrically imbalanced and the observed agreement is greater than 50%. Also, the B-statistic and the AC1-index provide values closer to the observed agreement when the subjects are classified mostly in one of the diagonal cells. Finally, the B-statistic is seen to be consistent and more stable than kappa under both types of paradoxes studied. The B-statistic behaved better under all scenarios studied as well as with varying prevalences, sensitivities and specificities than the other measures, we recommend using B-statistic along with its corresponding agreement chart as an alternative to kappa when assessing agreement in 2x2 tables. where Po is the proportion of overall observed agreement and Pe is the proportion of overall chance-expected agreement. The kappa statistic thus ranges between – Pe / (1-Pe) to 1. 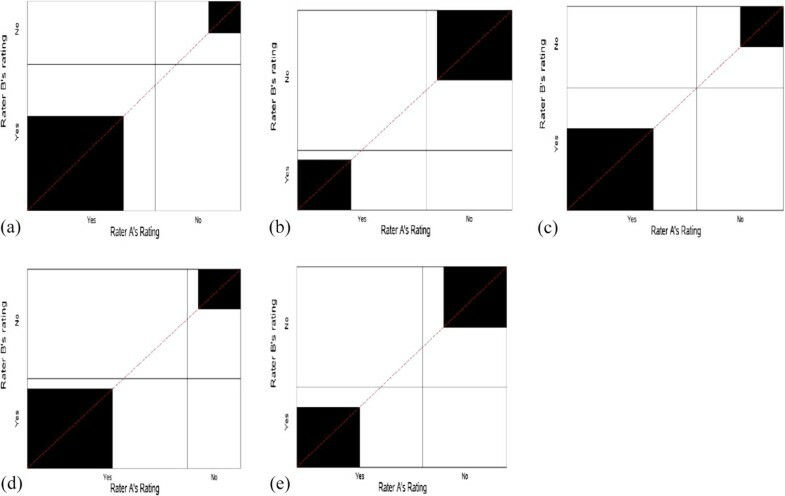 Kappa’s behavior has been questioned and its use debated for 2 × 2 tables [5–11]. The major concern is that its behavior is subject to changes in prevalence [9, 11]. In addition, there are two paradoxes discussed by Feinstein and Cicchetti  related to the effect on kappa of the balance and symmetry of the marginal distributions. In the generic 2x2 table (Table 1), balance refers to whether the ratio of column marginals (f1/f2) and the ratio of row marginal (g1/g2) are close to 1, while symmetry refers to whether the difference in column marginal (f1-f2) has the same sign as the difference in row marginal (g1-g2). The first paradox noted by Feinstein and Cicchetti  was that one gets lower kappa values despite high observed agreement [PO = (x11+ x22)/N)] when the marginals are imbalanced. The second paradox is that one has higher kappa values for asymmetrical than for symmetrical imbalanced marginal totals and for imperfect versus perfect symmetry in the imbalance. Cicchetti and Feinstein  suggested resolving the paradoxes by using two separate indexes (ppos and pneg) to quantify agreement in the positive and negative decisions; these are analogous to sensitivity and specificity from a diagnostic testing perspective. PI = x 11 - x 22 / N .
Note that BI = 0 if and only if the marginal distributions are equal. PI ranges from -1 to +1 and is equal to zero when both categories are equally probable. Similarly, Lantz and Nebenzahl  proposed that one should report supporting indicators along with kappa - PO, a symmetry indicator, and ppos. Unfortunately, reporting of multiple indices is often not done. This manuscript considers the various alternative single indexes for observer agreement in 2x2 tables, and examines their behavior under different scenarios of marginal distributions, balanced or not, symmetrical or not. It is an attempt to shed more light on how these measures address the paradoxes identified by Feinstein and Cicchetti , but also to examine their behavior in broader situations encountered in 2x2 tables. In addition to Cohen’s kappa, we consider the following statistics: Bangdiwala’s B-statistic [13, 14], Prevalence Adjusted Bias Adjusted Kappa (PABAK) , Aickins’s alpha , Andrés and Marzo’s Delta [16, 17] and Gwet’s AC1-index . where xij is the cell entry of the ith row and jth column, g i. is the ith row total and f .i is the ith column total and i = 1, …, q categories [q = 2 in this paper]. The agreement chart reflects the marginal totals by rectangles and the diagonal agreement by darkened squares within the rectangles. Note that the B-statistic is a proportion of areas and thus ranges in values between 0 and 1. Agreement chart for hypothetical data from Table 1 assessing agreement between two raters classifying N units into the same two categories. In order to examine the behavior of the above statistics, we specify similar scenarios as Byrt et al., Feinstein and Cicchetti , Cicchetti and Feinstein ; these are provided in Table 2. The corresponding agreement charts are presented to help the reader visualize the degree of agreement, and balance and symmetry of the marginal totals. Table 2 also presents the observed agreement (PO), bias index (BI), and prevalence index (PI). Scenarios 1-3 address the issue of paradox 1, having a high-observed agreement but a low value for kappa. Scenario 1 has symmetrically balanced marginal totals, while scenarios 2 and 3 are symmetrical imbalances. Figure 2 presents the corresponding agreement charts for the 3 scenarios, and provides a visual image of the lack of balance. 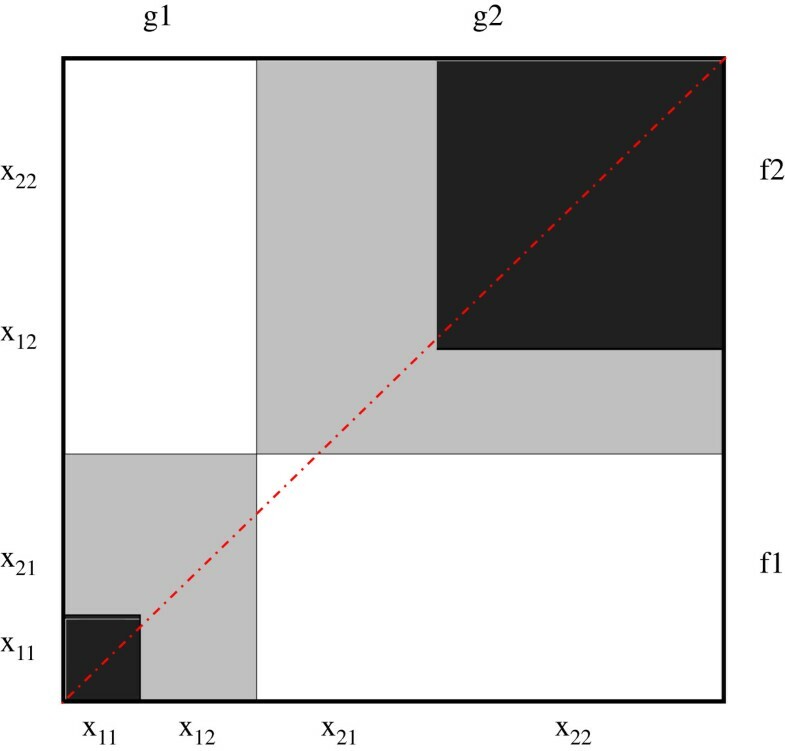 The agreement chart for scenario 1 has darkened squares of relatively the same size than the agreement charts for scenarios 2-3, within rectangles that are also close to square. The amount of darkening suggests there is a high level of agreement in all three scenarios. Agreement charts (a-c) for scenarios 1-3 of Table 2 , addressing Paradox 1. We note that under symmetry, all the statistics (see Table 3) are comparable and relatively high [scenario 1]. For symmetrically imbalanced cases, we notice that when the prevalence index (PI) is large, kappa has a low value [scenarios 2 and 3]. Kappa goes as far as having a negative value for scenario 3, indicating agreement less than that due to chance. Alpha is not calculable if any cell is empty or odds ratio <1 as is the case in scenario 3. When the observed agreement is present in only one of the diagonal cells (scenario 3), AC1-index and B-statistic have values very close to the observed agreement PO. In order to better understand the role of prevalence in Paradox 1, we also examined the influence of prevalence, sensitivity and specificity on the various statistics (Figure 3a-d). We considered four scenarios with varying prevalence (a) both sensitivity and specificity set at 95% (b) sensitivity of 70% and specificity of 95% (c) sensitivity of 95% and specificity of 70% and (d) both sensitivity and specificity set at 60%. Under scenario (a) with high sensitivity and specificity, all the statistics are influenced by prevalence, B-statistic and AC1-index behave similarly and are less affected by prevalence indices closer to 0 and 1. Thus, they adequately address paradox 1. When the sensitivity and specificity are different, the B and AC1-index behave better than the others. When the sensitivity is smaller compared to specificity (Figure 3b), the estimates of B and AC1-index are closer to the observed agreement PO with small prevalence while when the sensitivity is larger than the specificity (Figure 3b), the B and AC1-index are closer to the observed agreement at higher prevalence. When both sensitivity and specificity are closer to 50% (Figure 3d) only the B-statistics behaves well. All the statistics except for delta statistic behave in a quadratic fashion as the prevalence changes under all scenarios. Delta behaves in a strict linear form. 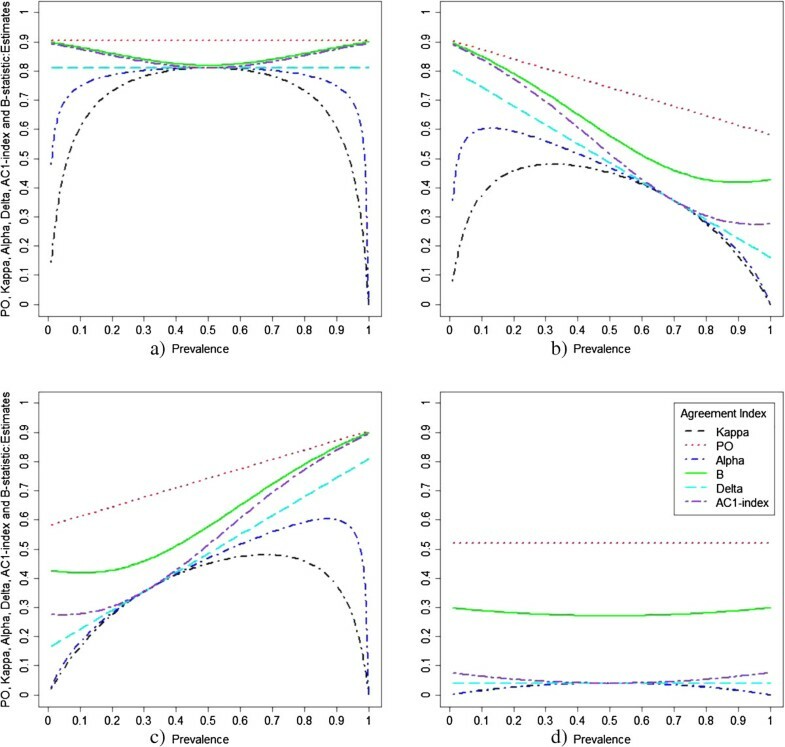 Measures of agreement as a function of prevalence, for (a) both sensitivity and specificity set at 95%, (b) sensitivity of 70% and specificity of 95%, (c) sensitivity of 95% and specificity of 70%, and (d) both sensitivity and specificity set at 60%. In order to address the second paradox, we consider scenarios with symmetrical versus asymmetrical imbalanced marginal totals (scenarios 4-8 with same PO = 0.60) and scenarios with perfect symmetrical imbalance versus imperfect symmetrical imbalance (scenarios 9-10 with same PO = 0.90). 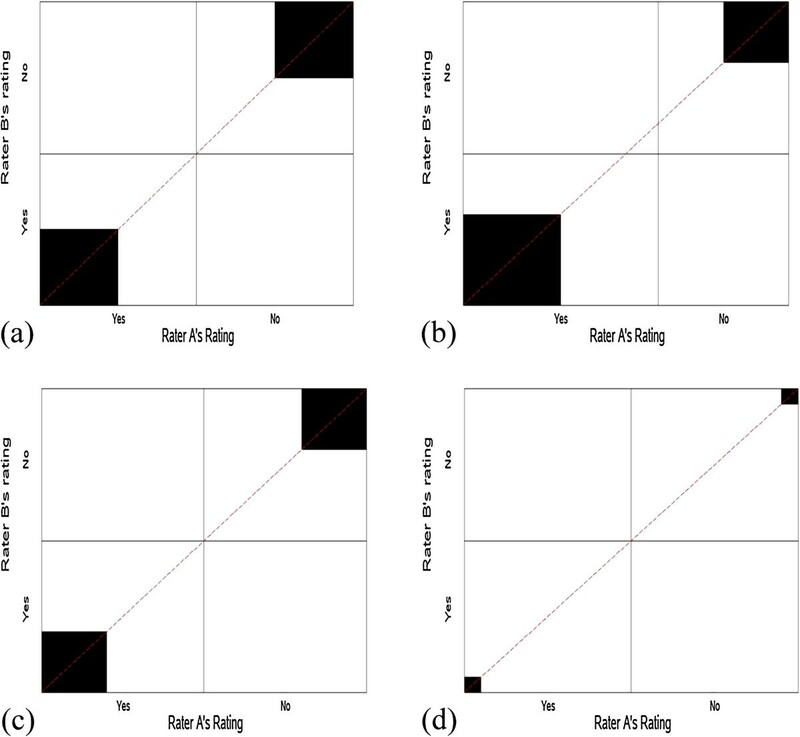 Figure 4 presents the corresponding agreement charts for scenarios 4-8, in order to aid the reader in visualizing differences in amount of symmetry when imbalanced, but the observed agreement PO is constant. We note that asymmetry results in the diagonal line not coinciding with the vertex of the rectangles, and the direction of the asymmetry depends on the direction of the bias: negative bias index has a diagonal below the vertex and positive bias index has a diagonal above the vertex. Perfect symmetry is when there is no bias and thus the vertex meets the diagonal line. Figure 5 shows the corresponding agreement charts for scenarios 9-10 in order to provide a visual of imperfect versus perfect symmetrical agreement for a high value of PO. We notice a larger area of darkened squares, and that imperfect symmetry under high agreement forces one of the off-diagonal cells to be zero. Agreement charts (a-e) for scenarios 4-8 of Table 2 , addressing Paradox 2. Agreement charts (a-b) for scenarios 9-10 of Table 2 , addressing Paradox 2 with high P O .
Kappa, alpha and delta have higher values of agreement for asymmetrical imbalance (scenarios 5 and 7) than for symmetrically imbalanced marginal totals (scenarios 4 and 6), contrary to what is desired. The B-statistic behaves slightly better, with lower values for asymmetry (comparing scenario 4 to 5), and despite having higher values for symmetry than for asymmetry in scenarios 6 versus 7, it is not as discrepant as the other statistics. This trend was similar in the AC1-index. Comparing the degrees of symmetry (scenarios 9-10), we expect that perfect symmetrical imbalances (scenario 9) should have higher agreement than imperfect symmetrical imbalances (scenario 10). PABAK does not change with changes in prevalence or bias since it is a simple function of PO (scenarios 4-10). We note that kappa and delta have higher values of agreement for imperfect versus perfect symmetry, while the B-statistic and AC1-index behave as one would prefer (scenario 9 vs. 10). B-statistic and AC1-index perform better than the other statistics when PO is larger (scenarios 9-10 vs. scenarios 4-6). When the bias index is greater or equal to the prevalence index (scenarios 1, 5, 7, 8, 11, 12, 13 & 14), the AC1-index is almost same as the PABAK. The slightly poor performance of B-statistic for lower PO values is seen when the bias index is greater than the prevalence index (scenarios 4 vs. 5 and 6 vs. 8). In scenarios 4-8 with PO = 0.60, most indices perform poor, with values substantially lower than PO; however, the B-statistics is closer to PO. Thus, B-statistic resolves paradox 2 when PO is large and comes closer than the other statistics when PO is smaller. Scenarios 11-14 examine the behavior of the statistics when PO ≤ 0.50 (Figure 6a-d). This situation can arise in social or behavioral studies, where there is increased difficulty in classifying the units/individuals. We note that under these scenarios, all statistics except B-statistic show no agreement beyond chance. The B-statistic behaves as the square of PO and leads to a better interpretation. Agreement charts (a-d) for scenarios 11-14 of Table 2 , addressing P O < =0.5. \While all statistics examined are affected by lack of symmetry and by imbalances in the marginal totals, the B-statistic comes closest to resolving the paradoxes identified by Fienstein and Cicchetti  and Byrt et al.. Alpha behaves similarly to kappa and is thus greatly affected by the imbalances and lack of symmetry in the marginal totals. The B-statistic and AC1-index were less affected by the imbalances and lack of symmetry in the marginal totals, and were also less sensitive to extreme values of the prevalence. Delta behaves somewhat intermediate between B-statistic and kappa. Delta uses an arbitrary category for calculation in the 2x2 scenario, which makes it not realistic; but the asymptotic estimation with increment of one is closer to non-asymptotic estimates. The B-statistic came closer to resolving both paradoxes than any of the other indices, and thus we recommend use of the B-statistic when assessing agreement in 2x2 tables. However, we note that as Nelson and Pepe  suggest, visual representations ‘provide more meaningful descriptions than numeric summaries’ (p. 493), and thus we recommend additionally providing the corresponding agreement chart to illustrate the agreement as well as constraints from the symmetry and balance of the marginal totals and cell frequencies. The B- statistic is easy to calculate and along with the agreement chart, it provides interpretations of the agreement pattern as well as the disagreement pattern between the raters. The B-statistic behaved better under all scenarios of marginal distributions studied, balanced or not, symmetrical or not, as well as with varying prevalences, sensitivities and specificities than the other measures. We recommend using B-statistic along with its corresponding agreement chart as an alternative to kappa when assessing agreement in 2x2 tables. The Division of Biostatistics, Albert Einstein College of Medicine, Bronx, NY, provided support for open access publication. VS was involved in conceptualization, literature search, writing, data analysis and creating charts for the study. SIB was involved in conceptualization, writing and data interpretation of the study. Both authors read and approved the final manuscript.